Cryptocurrencies as well all know is gradually innovating our financial sector today, with the invent of Bitcoin in 2009. Bitcoin is one of the most popular cryptocurrencies in the world, and is gradually being accepted by various individuals, businesses, firms, along side others. Cryptocurrency exchanges are online platforms where one can exchange one cryptocurrency for another cryptocurrency or sometimes for Fiat currency. Centralized exchanges are online cryptocurrency platform that makes use of a third party or middle man to execute transactions no matter the asset that may be in place. Centralized exchanges also come with high transaction charges, poor security and poor support services This centralization feature has created severe obstacles for the development of Blockchain-based markets. Atomic wallet platform believes the main soluiton to the aforementioned problems is creating a decentralized platform for these digital assets. Atomic wallet platform provides custody-free, transparent, immutable cryptocurrency trading. Atomic wallet is a decentralized multi-currency platform that provides a powerful, in-demand service that allows users to reduce effort spent on managing crypto assets and makes it transparent and reliable. Atomic wallet platform is not just a wallet but also has a cross-chai Atomic swap exchange and a decentralized order book. Receive crypto assets to the generated wallet. Import assets to the wallet using private keys of various formats. Store private keys in a securely encrypted environment. Send assets to other addresses. Select cryptocurrency node to use. Select blockchain explorer to use. Create order and deploy it to the DOB. Get list of available orders from the orderbook. ATOMIC SWAPS: The Atomic Swaps is a cross-chain exchange feature that makes it possible for users to exchange cryptocurrencies between each other without third-party interference. DISTRIBUTED ORDERBOOK (DOB): Order book is an electronic list of buy-and-sell orders of specific security or financial instruments, organized by price level. Atomic distrivuted order book (DOB) is based on a BitTorrent protocol. BitTorrent is one of the most common communication protocols for peer-to-peer file sharing (“P2P”) and can transferring of large files, such as digital video files containing TV shows or video clips or digital audio files containing songs. TRADES HISTORY BLOCKCHAIN STORAGE: The Atomic wallet platform is designed to use a custom-built Byzantine consensus algorithm that keeps DOB historical data safe without needing to mine blocks. This feature also makes it near impossible for a bad actor to add incorrect data or change the history in Atomic Wallet Blockchain. SHAPESHIFT: The Atomic wallet community voted shapeshift as a default option for instant exchanges. 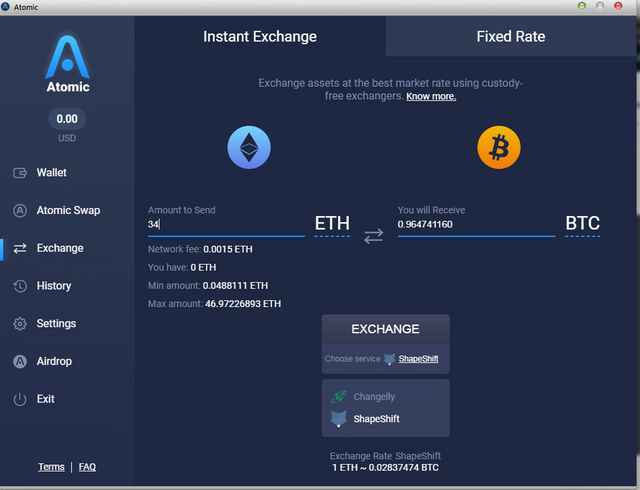 ShapeShift is the fastest and most convenient way to swap digital currencies, with the exchange rate always remaining competitive. CHANGELLY: Changelly is a popular cryptocurrency exchange that has been in operation since 2015 with over 1.5 million registered users . Changelly acts as a mediator between trading cryptocurrency platform and users providing over 90 altcoins at the best market rates for a seamless exchange. FIAT OPTIONS : Atomic will not process fiat operations himself following “do not touch fiat” policy. Fiat options to be provided to the customers in cooperation with partner services. Atomic Wallet is available for all major Operating Systems. Click to Start downloading. Download and install Atomic wallet to your desired device. After the process of verification you will receive an email with the promo code. Share it on your social networks. When other users install Atomic Wallet App and verify their emails — you will receive 25 extra AWC tokens for each installation. Atomic wallet will issue its own token known as the Atomic wallet Coin (AWC). AWC will run on smart contracts based on the Ethereum blockchain with ERC20. Conclusively, Atomic wallet is a Multi-asset Wallet with cross-chain Atomic Swap exchange and decentralized orderbook that supports so many crypto coins and tokens such as; BTC, ETH, DCR, LTC and 200+ ERC20 tokens., as well managing user’s crypto porfolio in a single smooth interface.